Solar powered electric train, purchased in the scope of the CARS-OUT! project under the EEA Financial Mechanism, yesterday made its debut by setting off on its first run across the Sečovlje Salina Nature Park – the first Slovenian car-free nature park. Totalling almost a million Euros, of which 95 % were provided in grant by the EEA Financial Mechanism and the Government Office for Development and European Cohesion Policy, this cutting-edge project pursued conservation of natural and cultural heritage by delivering an environmentally and visitor friendly manner of visitation and sightseeing. Now that support activities planned under the project have been realised, the Sečovlje Salina Nature Park has become the first Slovenian nature park where motorised vehicles, with the exception of intervention and service vehicles, are banned. 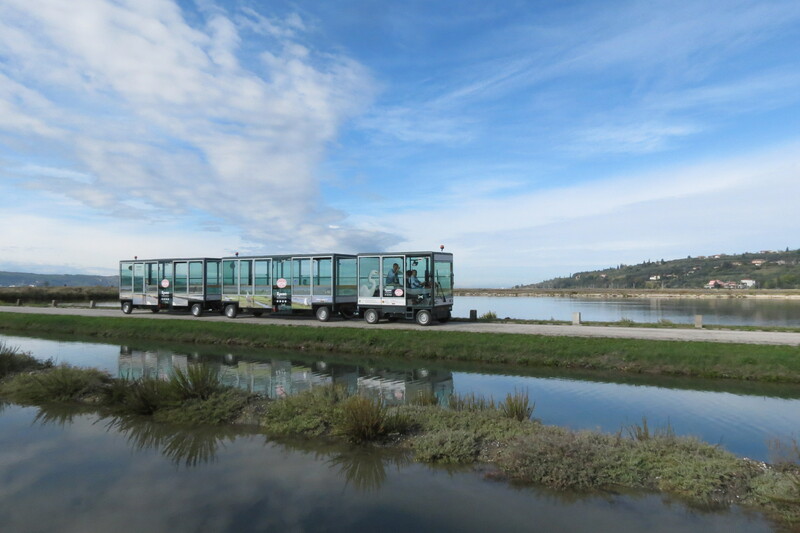 The electric vehicle, which has two trailers that may seat up to 56 visitors and is also fitted with solar panels, is not the only acquisition to the park. The visitors will also avail themselves of four electric and four traditional bicycles which will make sightseeing in the park easy and enjoyable. Last but not least, the visitors may also visit the park by walking along newly created footpaths and repaired old ones.